Driven by a storm from their usual area of work, a crew of Greek sponge divers found themselves off the Aegean Island of Antikythera. There, in 200 feet of water, they discovered the remains of a shipwreck from classical times. In 1958, a young British historian of science, studied this device and came to some startling conclusions: the Anikythera device, was an astronomical computer originally enclosed in a wooden box and looking like an old fashioned table clock. The device had a series of precision brass gears that rotated the dials. The metal has low cost, non-corrosive property and is easy to machine. Brass has good strength and hardness. Brasses have good electrical conductivity. Their high conductivity with good corrosion resistance makes them ideal for the manufacture of electrical equipment. Condenser and heat exchanger tubing also make use of the good thermal conductivity of brass. 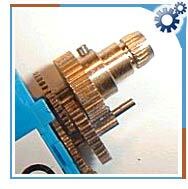 Brass is widely used for low cost commercial quality gears. Brass gears are also used in locomotives, clocks and in all thermal industries. Brass gears are often used in clocks where they work well without any lubricant. Oil causes dust to adhere to the gears and this causes gear-tooth wears. An advantage of brass gear is that constant meshing work hardens their teeth.